You are here: Home / Budgeting & Saving / How to Fix Bad Credit? Wondering how to fix my credit myself? Or how to fix bad credit? There's no doubt that living in the modern world requires credit. Yes, you can live without a credit card and survive on cash or cashback debit cards. I know because I did it for over two years as I paid off credit card debt. But what I really wanted to do was improve my credit score immediately. However, when you are ready to buy a house, you'll need to get your credit straightened out. 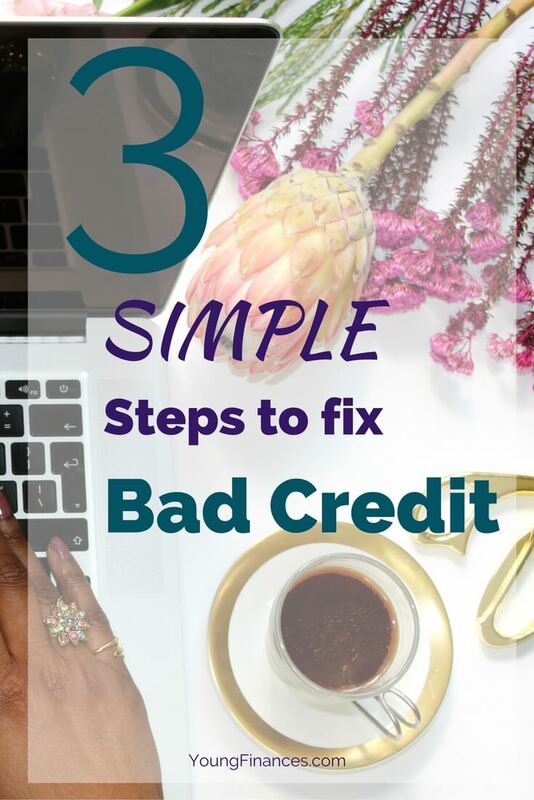 In this post I'll discuss getting a credit repair service as well as what steps you need to take if you decide you want to fix your credit score yourself. You might even be able to fix your credit in just 6 months. 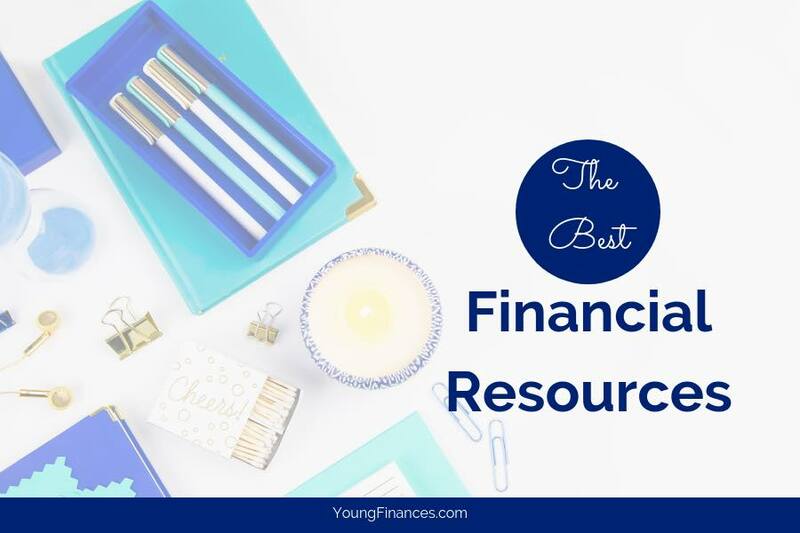 First, watch this video from my friend Dominique over at Your Finances Simplified. He's going to tell you exactly how to fix your credit. Feeling overwhelmed at the next steps? Take a deep breath. People think that having bad credit is the worse thing that can happen. But just calm down. You are taking the first steps which puts you on the right track. No one is going to die. Take control and get back in the driver's seat! The first thing you'll need is your creditor information. Get the most recent credit card statements, loan balances, and installment loan reports along with addresses and phone numbers. I recommend printing everything old-school style. It's going to come in handy later. Then, take a second to get your free credit report from AnnualCreditReport.com. Each year you are able to pull your credit report for free from the three providers Experian, Equifax, and Transunion. But that's ok. We're going to put you on the good foot. Fix 3: Review your credit report for errors (highlight each error). You're getting ready to take charge and stop being a victim. Most people don't even realize what they could get removed from their credit just because of errors. Wait a minute. So, you're telling me you didn't watch the video above? Scroll back up for me right quick and you'll find out exactly what you should look for. Dispute incorrect names, addresses, SSN, and date of birth via the certified mail. You will need supporting documentation and letters. You will have to write a dispute letter and include the specifics of the inaccuracies. You want to dispute inaccurate, erroneous, outdated, misleading, and unverifiable information in your credit reports. Tired of being harassed by your creditors? Maybe you'd prefer that someone else handle all of this for you? In that case, you might was to work with a credit repair company to improve your credit. Remove bankruptcies to rebuild credit? Permanently delete foreclosures and repossessions? Erase debts that were in collection? Completely get credit cards under control? Get the best financing on cars and homes? In that case, check out our partner Lexington Law for more details on how they can help you clean up your credit report. Finally, fixing your credit permanently also means creating good habits and getting out of debt. How getting out of debt is like the MTV show, I Used to Be Fat. I used to watch this TV show on MTV called I Used to Be Fat. The show documents young adults, usually high school seniors and high school graduates who want to lose weight before they start college. Each episode features a different teen. I absolutely LOVE this show. I like seeing the determination and perseverance of these kids, they are really focused on their goals. Most of them thought about quitting along the way but each one makes it to the end and they usually reach their goal. I was thinking the other day about how the TV show is very similar to a battle with debt. When you're in debt, it can feel like you're carrying around a second person, experiencing frugal fatigue, or that you have a spare tire of bills around your waist. I know because I'm working on getting out of debt myself. I realized that there are 3 major points we can learn from the MTV show I Used to Be Fat when trying to take control of our debt. Before the teens even begin a weight loss program, their coach/personal trainer gives them a large tear off number calendar to place on their wall. It has the total number of days until their program completion date, and every day they rip off the next number. 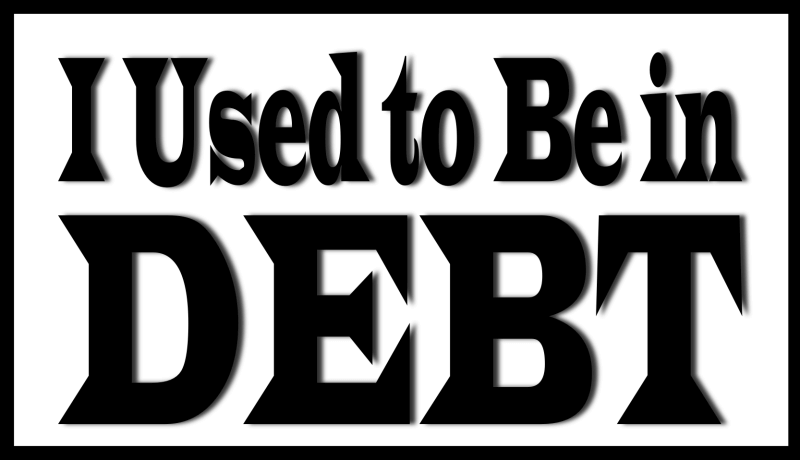 It is a good idea, when you are paying off debt, to set a deadline for your debt-free date, like 6 months. Setting a deadline is a way of making your goal specific. Every time you look at that calendar or see that date it will push your brain consciously and subconsciously to make it to your ultimate goal, to reduce spending and get out of debt. Every week, the kids had a weigh in. Their personal trainer was making sure that they were on track with how much weight they were supposed to be losing at each stage in the process. Sometimes they were attempting to lose one pound a day! I never thought that was possible or healthy, but most of the teens actually accomplished it under the supervision of their coach. If you really want to prioritize your goal of becoming debt free then you really have to give yourself check points. You can enlist the help of a friend or even a debt counselor to help you along the way. Having a good support system can make all the difference. When one of the teens was at a restaurant with her friends, she ordered a lean meal instead of the greasy french fries that her friends had. The personal trainer also taught her how to cook healthier meals so that she would be able to maintain her new lifestyle change. Becoming debt-free is not a one-time goal. It has to be a lifestyle change. When I decided to start getting out of debt, I had to first evaluate why I was in debt in the first place. I had to eliminate my habit of impulse spending and replace that habit with a good habit. Now I impulse buy stocks and my portfolio loves it! It's not easy to change a habit that took years to cultivate, but with a good support system, it is entirely possible. Poor credit affects your ability to rent, buy a car, get a home loan, and even open up accounts. Creditors don’t want to work with people with bad credit because the risk of not getting paid is very high. How can they trust that you will pay them back if you haven’t even paid others? If you’ve already tarnished your credit, here are some tips to help you fix your credit score and reestablish your life. Obviously, it will be very hard to get a regular credit card if you have bad credit. If you don’t qualify for a credit card, you can get a secured card instead. 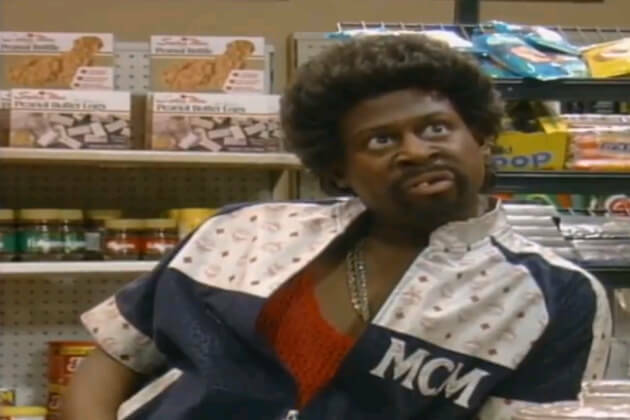 This is when the bank gives you a credit line equal to the deposit you make. If used wisely, a secured card can help nurse your poor credit to better health. You can improve your score quickly if you show that you can be responsible for both major kinds of credit: revolving (credit cards) and installment (mortgages, auto, student loans, etc.). If you don’t have an installment loan and feel you are ready to handle one, consider adding a small personal loan. Stay away from expensive finance companies and “teaser” deals, and use a company that reports the loan to all three credit bureaus. Credit cards come with high interest rates. We all know how our $2,000 computer ended up costing $8,168 because we only made the minimum payments at 20% on our credit card. Ouch, that hurts! Keep constant payments on your credit card (and don’t run them up again) and your balances will drop. If you have been responsible about paying your credit cards on time, the lender may agree to erase a late payment from your credit history. For more troubled accounts, communicate with your lender about possible options to erase previous delinquencies. If the lender agrees, it will improve your overall record. It’s very easy to ruin your credit, but it takes time to build it back up. No matter how bad your credit is, you can take steps to make it better. Sometimes we mishandle our budget, and we spend more than we should. (You know that you shouldn’t have bought that expensive flat screen TV). And, sometimes we end up in tough financial situations because of things beyond our control. Whether you have experienced job loss, illness, or another type of financial disruption, it’s important to know that you can turn things around. It may not be easy, but step by step, you will be able to fix your financial situation. Just don’t delay facing the issue. The longer you wait, the harder it is for you to recover.